STP Chair, Professor Leigh Sparks provides an overview of towns policy in Scotland from the Scottish Government's Review of Town Centres to the World Towns Leadership Summit hosted by STP, ATCM, BIDs Scotland and the IDA in June this year. 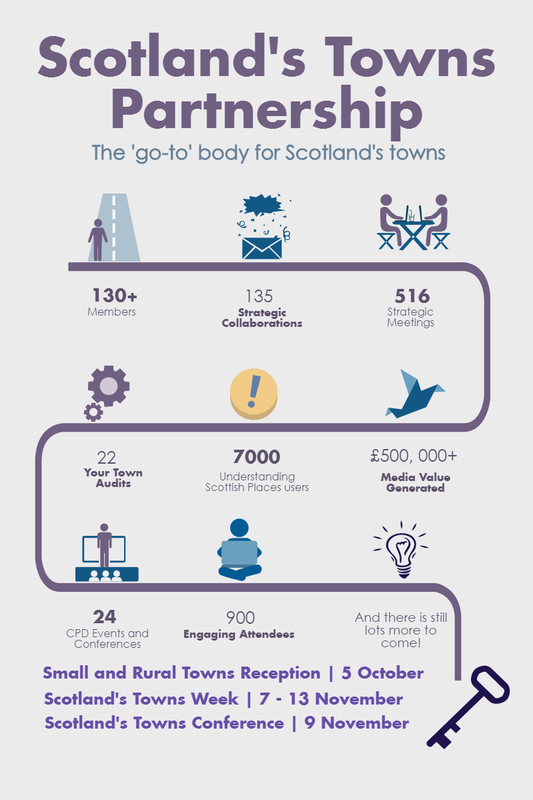 You can also take a look at STP's 2016 Infographic for some quick and key facts about Scotland's Towns Partnership. The attraction of many international delegates to the inaugural World Towns Summit in Edinburgh in June 2016 was eloquent testimony to the perception that Scotland has led the way in recent years in thinking about and producing action on towns and town centres. That international bodies selected Scotland as the location and trusted us to deliver speaks volumes about our international reach. At the Summit, and in the ongoing discussions since, there have been requests to understand what it is Scotland has set in motion. The danger is that this gets bogged down in detail, so this short, personal, piece is my view of the last 5 years or so. It is an insider’s commentary (I was on the National Review and am Chair of Scotland’s Towns Partnership), with all the faults that this can entail, but is intended to ‘join the dots’ at a high level. The onset of the ‘great recession’ in 2007-8 produced visible fault lines and scars across Scotland as elsewhere. It heightened awareness of, and the urgency needed to tackle the changing nature of place and towns and our economic, social and cultural lives. This is not to say that nothing was known or being done before this point, and indeed many organisations playing a vital role today were in operation then, or that the recession was the only problem. But, responses in 2008-11 felt piecemeal and addressed symptoms not the cause. In 2012, Nicola Sturgeon responded to the crisis in town centres by establishing a National Review of Town Centres, chaired by Malcolm Fraser the leading architect and urban thinker. Rather than focusing on the symptom – empty shops and a declining ‘high street’ – this review tackled the cause – what are towns for and how do we think about and care about place? Reporting in July 2013, the Expert Advisory Group focused on the underlying rationale for investing in, and re-energising towns. The social and economic benefits for all sectors of the population, and the essentially sustainable attributes of towns provide the focus for the recommendations. Under an overarching ‘town centre first’ principle the Review lined up six core themes to be pursued (town centre living, digital towns, proactive planning, accessible services, local economic growth, creative and entrepreneurial places). Continue reading and download the full article here.